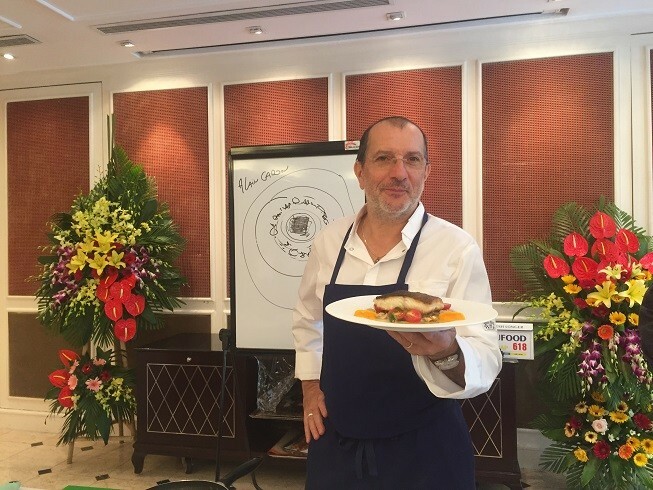 B: Let"s join us in a cooking class organized at the Sofitel Legend Metropole Hanoi Hotel this October. Today, Master Chef Alain Caron from the Netherlands will show us how to make Trout with aubergine caviar, almonds & lemon dressing. A: You can find dozens of recipes with trout - smoked trout & pea pasta, trout with creamy potato salad, trout risotto, and so on - but trout with aubergine caviar & lemon dressing is a particularly a creative combination. B: Chef Caron got this idea when he visited a Vietnamese market looking for ingredients and ideas for his cooking. 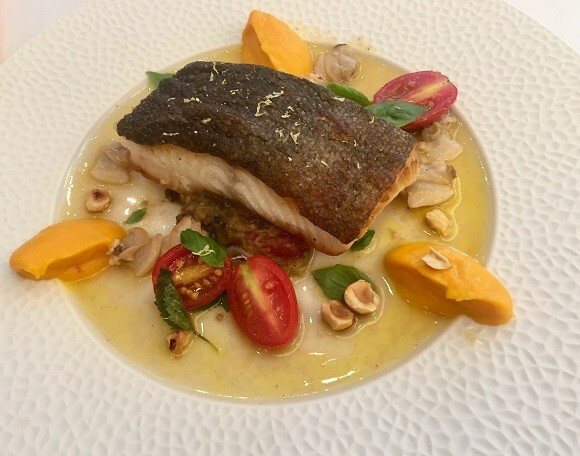 A: To prepare the dish, we need trout, of course, aubergine – also called eggplant -tomatoes, vinegar, olive oil, thyme leaves, a lemon, crème fraiche, pureed carrots, toasted almonds, shallots, and garlic. Chef: For the recipe we have tomatoes, small tomatoes, we put olive oil, rosemary and we put in barbecue. No salt, no pepper. After, we have aubergine, we grill also in barbecue with salt and pepper. For the garnish, we have garlic with olive oil. We have some walnut, we crush a little bit to put in the aubergine. When we finish, we call it caviar aubergine. We don’t use the skin, just the inside, because the skin is too heavy and not delicious. B: After peeling the skin, we chop the aubergine flesh, and then keep mixing until it becomes a paste. I see here some herbs. Should we mix them with the aubergine? Chef: Then, we use some Vietnamese herbs, we mix with the aubergine paste. We have fish. We marinate it in olive oil with salt and pepper. Then, we bake it in the pan. A: The trout is cooked until the flesh is soft. The next step is to make the dressing. The dressing is made with the vinegar lemon, olive oil, and almonds. B: The purred carrots have already been prepared by the chef to save time. Alain, what have you got in this puree? Chef: We make a puree of carrots with star anise, cinnamon, salt, pepper, honey, olive oil, and orange juice. We cook with a bit of water. When we finish, we take the cinnamon and star anise out. We have carrots puree, the taste is very lovely. It’s sweet but a little spicy. Then, we use some cream. A: Now that the fish, the sauce, and the puree are ready. Let’s garnish it on the plate. Chef: After, we place the eggplant caviar on the plate, we put some puree, some olive oil, put a little bit of cream, and we put the fish on top of the eggplant. B: Don’t forget to put some herbs on top of the fish. The tomatoes are cut into halves. Garnish them around to make your dish more colorful. And bon appetit, everyone.